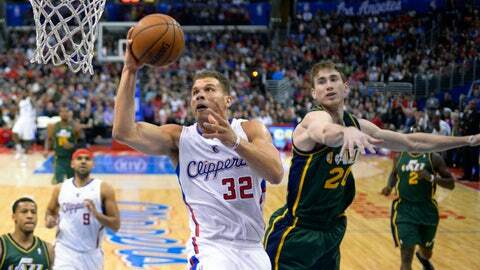 Blake Griffin made his first 12 free throws and finished 14 for 17 from the foul line. LOS ANGELES (AP) — Blake Griffin scored a season-high 40 points, overcoming early foul trouble and a career-worst eight turnovers to lead the Los Angeles Clippers to a 98-90 victory over the Utah Jazz on Saturday night. Griffin made his first 12 free throws and finished 14 for 17 from the foul line. The three-time All-Star, who entered this season a 61.1 percent career free throw shooter, has made 80.6 percent of his attempts over his last eight games and raised his season mark to 70 percent. Chris Paul had 21 points, 10 rebounds and nine assists for Los Angeles. 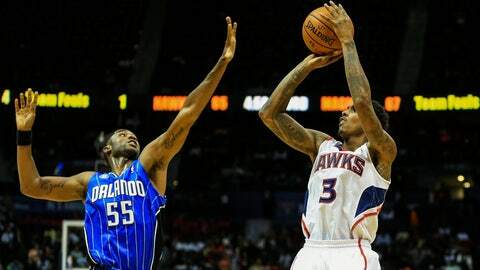 Shooting guard Jamal Crawford missed his first five shots and finished 4 for 16 with 13 points after averaging 20 points and 40.3 percent shooting from the field in seven games after he was inserted into the starting lineup. The Clippers, coming off a pair of narrow road losses to Golden State and Portland — the latter in overtime — haven’t lost three in a row yet this season. Enes Kanter had 17 points off the bench for the Jazz, including a 16-footer with 4:20 remaining — their last field goal of the game. Utah’s 9-24 record is the second-worst in the NBA and just 1 games ahead of Milwaukee. Derrick Favors, who made the game-winning dunk off an offensive rebound in the final seconds of Utah’s 105-103 home win over the languishing Lakers on Friday night, had four points and nine rebounds during a foul-plagued 22 minutes before fouling out with 1:19 to play. The Clippers closed it out with an 8-0 run triggered by Griffin’s go-ahead dunk with 2:25 remaining. Utah led 43-42 at halftime despite 11 turnovers that were converted into 15 points. The Clippers, who committed a season-low six turnovers in Thursday night’s loss to the Trail Blazers, had four in the first 1 minutes against the Jazz and finished with 13. Three of the early miscues were by Griffin, whose second foul landed him on the bench with 7:54 left in the opening quarter. Los Angeles missed all six shots from 3-point range before the break, the third time this season the Clippers were blanked from behind the arc in an entire half. They didn’t connect from long range until their seventh attempt, when Crawford drained one from the right elbow 14 seconds into the third quarter for his first field goal of the game. The Clippers have beaten Utah seven straight times, after losing 11 of the previous 12 meetings. The winning streak matches their longest against the Jazz (Nov. 3, 1979 to Dec. 20, 1980). NOTES: Griffin became the fourth player to score at least 30 points against the Jazz, joining Kevin Durant (42), James Harden (37) and LeBron James (30). … Jefferson, born in Los Angeles, is averaging 14.6 points in 28 career games against the Clippers. … Paul’s 111 double-doubles are the most by any point guard since the start of the 2010-11 season. Next on that list is Deron Williams of the Nets.